Poplar Springs Farm rests in the shadows of the Blue Ridge Mountain of NC, tucked neatly within the foothills of Cleveland County. 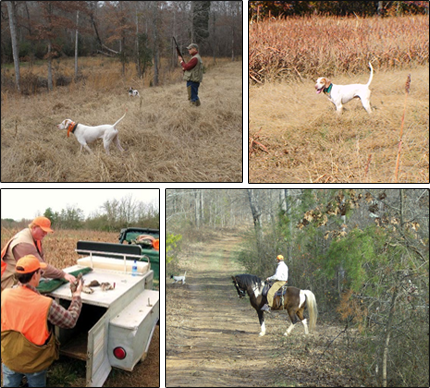 With fields of milo, millet, broom sedge, sunflowers, wild and native grasses the farm offers a variety of ground cover, adding a heightened sense of adventure to the most stimulating and challenging upland bird hunting experience the South has to offer. Picture acres of gently rolling fields and woods with a babbling stream running through it, over four miles of horseback-riding trails and a seemingly endless white rail fence and you begin to imagine the scenic beauty the farm affords to experienced hunters and novices alike. During the off-season people from surrounding counties come to use our facilities for corporate business or team building meetings, celebrate reunions and engage in a whole variety of other social gatherings.